For other wonderful items, make sure to visit us at our About Me Page. Strange Tomb of Dracula #44 Original Art by Gene Colan. Original artwork for Tomb of Dracula #44 (Marvel, 1976) by Gene Colan (pencils) and Tom Palmer (inks). The middle tier is basically one large image (1/3rd splash) and is a beauty to behold! Excellent condition with image measuring 10" x 15". 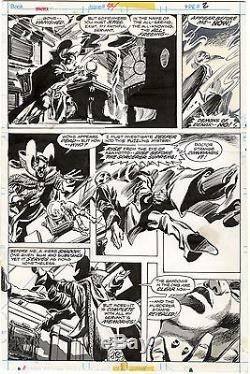 Strange Tomb of Dracula #44 Original Art 1/3rd Splash by Gene Colan" is in sale since Thursday, December 04, 2014. This item is in the category "Collectibles\Comics\Original Comic Art\Splash Pages". The seller is "water-walker" and is located in San Diego, California. This item can be shipped to United States.